Saturday morning, January 21, 2017, I woke up in anticipation of what was about to happen. This wasn’t a day like any other; to me it was the beginning of making history. As I pulled on my pink hat and “Nasty Woman” t-shirt, there was a palpable excitement in the air that made me both anxious and determined. In less than three hours, I would be standing with hundreds of thousands of women, protesting for equality everywhere. All of this a mere ten minutes away from the White House. 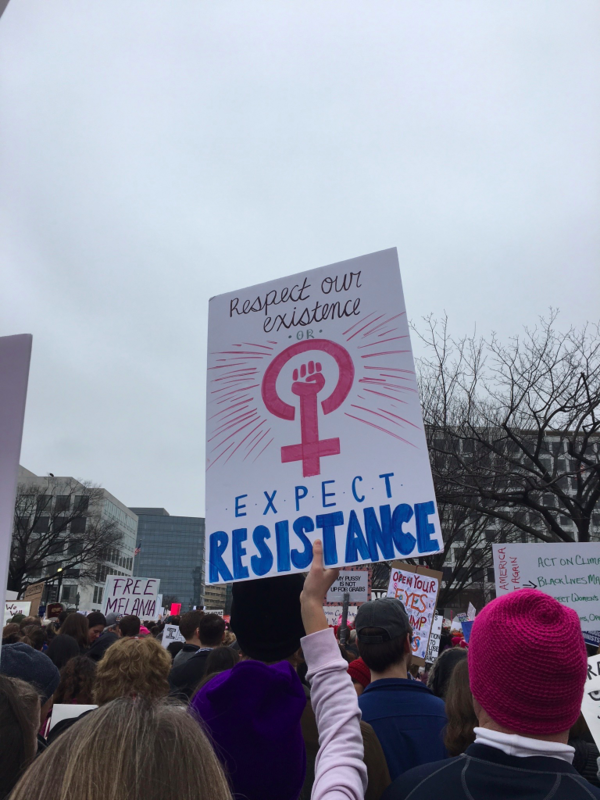 But there was nothing that could have fully prepared me for what I was about to experience at the Women’s March on Washington. It’s hard to believe that the Women’s March, which brought more than half a million people to D.C. in protest, started with a Hawaiian grandmother asking friends to march in protest of gender inequality, as well as other issues, on Inauguration Day. Soon enough, one post became many, and a march became the march that garnered worldwide support. The march featured speakers such as Angela Davis, Gloria Steinem, America Ferrera, Cecile Richards and Tammy Duckworth. They promoted the unity of women in the face of all differences. The rally, which was supposed to end at 1pm, ran long due to the number of speakers. 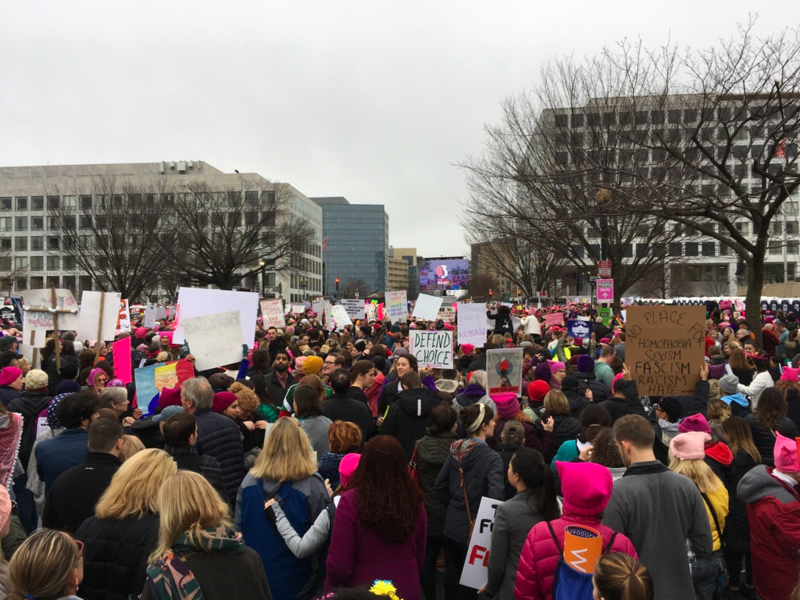 By 3pm, there were over 500,000 marchers in D.C.
CHS Freshmen Fiona Galinsky and Kaya Hencke marched at the Washington rally. Both were very excited about what the march could accomplish. “I’m going because it’s important to show that we need as many people there as possible to make an impact. This needs to be marched for. This needs to be recognized. It’s important to stand up for these issues,” Galinsky said before the march. Closer to home was the Raleigh march, which many Carrboro students attended as well. Two students, Emily Joashi and Angelique Streamo-Pinard, went together. They described the atmosphere of the march as energetic and positive. “It made me realize that if you all think the same thing, all have one similar view, you can come together with each other to achieve a goal. Since we were all there under a common thing, we were able to do it together,” said Joashi. Why the Extra Five Minutes? With shorter breaks and longer instructional time, many students question the need to make up recent snow days. 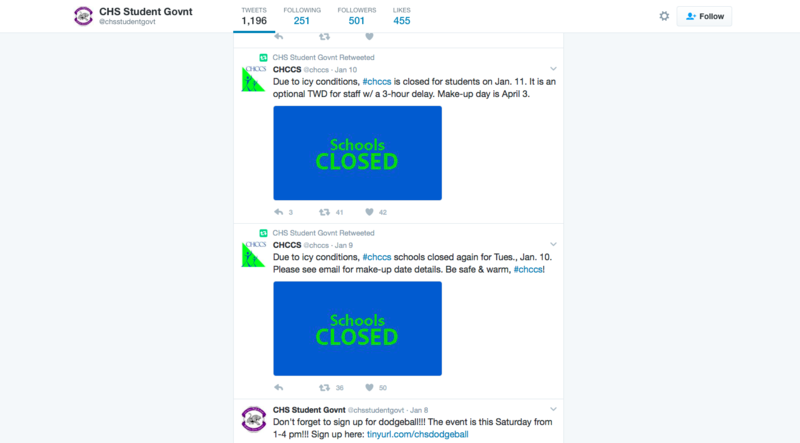 High schools now let out at 3:55, five minutes later than in previous years, and all CHCCS students had a shorter winter break. The question on many students’ minds: if not to prevent inclement weather days, what purpose do these changes serve? District officials expressed their reasoning in a recent email statement. Until this academic year, elementary and middle school instructional time was longer than that of district high schools. Adding five minutes ensures equal time to learn. The extra five minutes will also serve as a last resort for inclement weather, only if all other make-up options are exhausted. “This was done to minimize the possibility of holding school on Saturday or Memorial Day, as was the case in the 2014-15 school year,” said the statement. With regard to winter break, the district explained that the change in length is not tied to inclement weather days. Rather, all school systems must comply with North Carolina’s requirements for academic year length. Frustrated parents and students can express their concerns to the NC General Assembly.